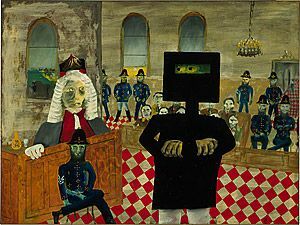 Australian artists Shaun Gladwell and David Noonan were very excited to hear that The Sidney Nolan Trust holds a copy of the iconic armour worn by Ned Kelly and his gang. The armour was made for the 1970's film portraying the outlaw's life which starrred Mick Jagger. The significance of Ned Kelly to Australians and the crudely made helmet and breast plate can not be underestimated and Shaun, David and Vanley spent a very happy hour trying it all on and posing for the camera!